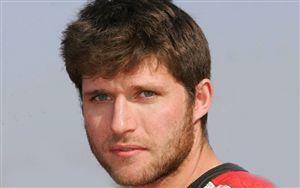 Guy Martin crashed during the second day of qualifying for the Macau Motorcycle Grand Prix. The Honda rider slid into an unprotected concrete wall and suffered a suspected broken wrist as well as concussion. Michael Rutter topped the time sheets with a time of 2min26.64s on the Aviva MSS Kawasaki, three tenths quicker than second-placed Yamaha Austria's Thomas Hinterreiter. John McGuiness was third on the Stobart Honda while Guy Martin was listed as fourth quickest on the Solent Scientific Honda.